This is a Flickr badge showing public items from expknitter tagged with knitting. Make your own badge here. Copyright 2009-2012, all rights reserved. Reproduction of any text, image, pattern, etc. forbidden except by written permission of site owner. For the EFA KAL, as I mentioned before, I started my 3rd EFA with a new cast-on I learned in honor of the EFA. To see a close-up of it, click here. It's really quite easy, much more so than the Channel Island cast on. And you don't have to try to guesstimate how much yarn you need for the cast on edge, like you do with long-tail or Channel Island or German twisted or many other types of cast on methods. Here's how you do it. ALERT! I'm left-handed so my needle is in my left hand when I cast on. 1) Start with a stitch casted on by the simple cast on (or thumb method), it'll give a nicer appearance than a slip knot. Secure the tail along the needle with your fingers until the 1st stitch is secured . In all the photos, the tail of the yarn goes to the left while the yarn from the ball goes to the right. 2) Cast on a 2nd stitch by the same method. 3) Pull the 1st stitch over the newest stitch you made and tighten slightly. One stitch has been cast on. 4) Cast on 2 more stitches by the thumb method. 5) Pull the 1st of these 2 stitches over the 2nd and tighten slightly, now you have 2 stitches cast on. 6) Continue in this manner, always casting on 2 new stitches by the thumb method and pulling the 1st of the new stitches over the 2nd of the new stitches. Study what you have done: each time you pull the 1st stitch over the second, you create a little knot that secures the stitch in place. Plus, you created spaces between your stitches that will make your edge elastic when you knit your ribbing. With this cast on, I found that I could get a nice springy edge in 1x1 ribbing without using 2 needles to create width while I casted on. Look at both sides of your cast-on edge: they look different. Which edge is right side and which is wrong side is up to you; I decided after I began knitting that I liked the edge with the yarn tail coming off to my left more, so that's the right side of my EFA. What a nice technique! Thanks for sharing :) I'll have to give it a try. is there a guerney bind off as well? i've often had trouble finding bind-offs that that match the cast on... thank you. AFAIK, there aren't matching bind-offs to all cast-ons; Guernsey and Channel Island cast-ons would be particularly hard to match to a bind-off. I read that the real experts like Meg Swanson recommend matching the bind-off to the purpose (think the band of a toe-up sock). For traditional bind-off stitches, look at books by Beth Reinsel Brown,Rae Compton, Alice Starmore, and Elizabeth Zimmerman. 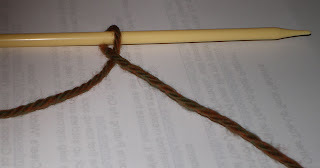 i have just read your tutorial on Guernsey Cast-on, and i have seen another tutorial where they use four strands of yarn around the thumb, can you tell me what the differnce would be. I'm pretty sure the tutorial you saw was for the Channel Island cast-on, not the Guernsey cast-on.